As the city of Bellingham plans to take out 4 parking places in front of Mount Baker Apartments to create a wider, nicer sidewalk, some folks are grumbling. Remove parking? The almighty automobile. And they say downtown may shrivel, but I notice "private enterprise" is removing "drive space" also. At the corner of Holly and State, it was once Washington State's largest drive-in bank. Now being torn down. Bellingham National Bank had 8 drive-in lanes when it was built in the late 70, early 80s era. Now, a new Key Bank is being built in it's place. Less lanes and most likely a bigger walk-in lobby. The last years of the drive-in bank were sad. Only a few of the lanes working and the walk-in lobby closed. Windows blocked with cubicle dividers so folks would "get the hint." "Lobby closed." Another Key Bank, down the street, served walk-ins at it's proud lobby in the vintage 1913 Bellingham National Bank Building. From what I hear, Key Bank plans to consolidate both branches to the old drive-in site. Hopefully, it's former home, the vintage 1913 tower will remain an office building. Meanwhile the larger sidewalk, in front of Mount Baker Apartments will be welcome "elbow room" in that crowded block. 85 studio apartments, all in that block, plus businesses along the street. The narrow sidewalk got a bit claustrophobic. "Move over," automobiles. 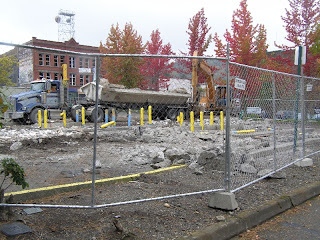 Downtown Bellingham is getting a bit more pedestrian oriented.